Appropriately named for its close proximity to the pier, 'Flounder In' is located in the middle of it all! In central downtown Surf City, within walking distance to just about everything the island has to offer: shops, restaurants, entertainment and fishing. A newly remodeled 4 bedroom, 3 bathroom oceanfront home that is perfect for the family or friends that are looking for a more 'upscale' vacation option. 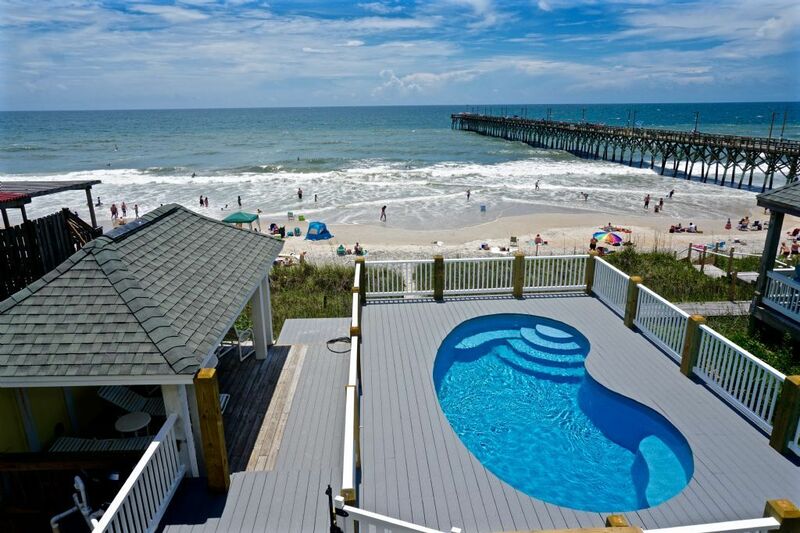 This home features large sweeping decks with a private oceanfront pool and gazebo where you can relax in the shaded hammock with a book, or catch a tan alongside the pool. A boardwalk provides access to the beach and ocean. Entering the home on the first floor, it soon becomes apparent as to why this is such a popular home. Spacious design and large windows open your 'indoor' experience into the beautiful sights and sounds of the beach. Upon entry, you are welcomed into the open kitchen and dining area. Just past the kitchen is access to a full bathroom. Head down the short hallway and you will find the separate living room with a twin bunkbed room and laundry room just off the living area. Head upstairs via the main stairwell and there will be a full shared bathroom to your right. Next to the bathroom are two queen Oceanside bedrooms. Wake up to the view of an incredible ocean sunrise over the Surf City Pier every morning of your vacation! Head down the hall and you will find the master bedroom which features a king sized bed, full bathroom, access downstairs via an open spiral staircase, and access to the oceanfront balcony. Sip coffee as you relax and watch the sun rise over the Atlantic Ocean. Enjoy a meal under the oceanfront gazebo, take a dip in the private oceanfront pool, or search for seashells on the beach. No matter how you choose to spend your day, 'Flounder In' provides everything you could need for a luxurious stay at the beach. Also, our vacation homes do not have many of the consumable items in stock for guest use (i.e. toilet paper, paper towels, soap, etc.). Once you book your vacation, we’ll provide you with a list of items that you may want to consider bringing with you on your vacation. The "What to Bring" list can also be viewed on our website under the Guest Services tab. We we very disappointed by how small the house was. Pictures are very deceiving. This house is in need of a major cleaning. The sofa is filthy ,outdoor furniture is covered in mold. Holes in walls in bathrooms. Vent covers are rusted out , some were falling into the ducts. House interior needs painting. Fence around pool is broken and dangerous. Spiral staircase missing a few screws. Trash from construction under house and around pool area. Owner needs to show some attention to the house soon. Surf city is a small little town. Not many restaurants. We really enjoyed fishing from the pier. This is a great rental for a couple. It's right in the middle of town, but feels very secluded when you are hanging out on the deck. Being able to walk down 10 steps from the pool to the beach was lovely! The deck and balcony could use a good power washing, but other than that, it was a great stay! Perfect place for two to get away. The view from the pool and gazebo was so nice and relaxing. Would love to return. Beautiful view. Hate the staircase. Absolutely loved the location and the private pool. Wish the cabana had shades on it and some of the electronic devices (television, blender and router) need to be upgraded. I did not like the staircase one bit. It made it almost impossible to carry a suitcase up. Great location, perfect for going with family but still having your privacy and a place to retreat!